Spirent Communications, the leader in testing positioning, navigation and communications technologies, recently announced the launch of its new SimSENSOR MEMS (Micro-Electro-Mechanical Systems) sensor simulation software. SimSENSOR is targeted at the R&D environment and enables performance testing of sensor fusion algorithms in navigation systems that include MEMS inertial sensors and multi-GNSS. SimSENSOR works in tandem with Spirent’s multi-GNSS constellation simulators by simulating MEMS sensor outputs on a common trajectory with the simulated GNSS signals. Trajectories that include representative human motion gestures, such as arm movements, are included with SimSENSOR. 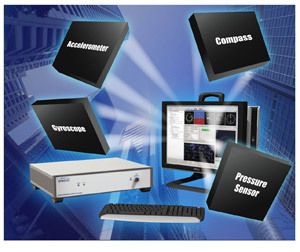 The ability to test fusion algorithms that take inputs from a wide variety of sensors is supported, including accelerometers, gyroscope, magnetometer, digital compass and barometric height sensors. Representative MEMS noise models and errors such as bias and drift are also included and are available under user control.